It's seems like we've been waiting for a while to see what actor-turned-director Keanu Reeves would offer up for his directorial debut. 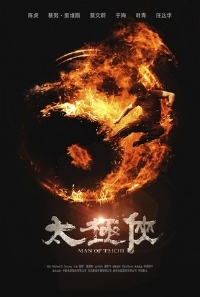 It didn't come as much of a surprise that the movie would be a martial arts spectacle but it's safe to say everyone's been wondering how well, or badly, Man of Tai Chi would turn out. The first trailer for the action packed movie, Reeves has said that it features 18 fight sequences totalling 40 minutes of the movie's yet undisclosed running time, has appeared and it's exactly what I expected it to be: full of impressive fight sequences and devoid of much else, so much so that the plot is still out of reach. Something about unsanctioned martial arts competitions in search of a man that can be turned into a killer. Reeves also makes an appearance in the movie, channelling an older version of Neo and it looks like he may even partake in some of the action though after watching the trailer twice, I still can't be completely sure it's him we see in at least two of the action shots. What we do get to see is lots of star Tiger Chen in action. No American distribution yet but with Reeves attached, I'd expect this will at least make the VOD rounds if nothing else. Ooooh...is Keanu Reeves becoming the next David Carradine? Maybe in about 10-15 years we can expect to hear that he auto-eroto-asphixiated in a hotel in Thailand also? My understanding is that Keanu plays the film's villain, which is a smart move on his part.